Day 8 in Japan. After flying, driving, walking and running for quite a few kilometres, we decided to indulge ourselves with a full day of relaxing: today is onsen-hopping day! Onsens are natural hot springs. There are many in Japan due to the intense volcanic activity, and Kyushu specifically is famous for them: Beppu, Yufuin, etc. Kurokawa is one of these cute mountain villages with no less than 24 onsens! We hand picked 3 of them as each offers specific water properties and unique settings. The onsen-hopping pass allowed us to do just that. We made sure we got rid off our footwear before entering the women’s changing rooms where we got fully naked, keeping only a 30cmx80cm modesty towel to cover up our privates. It is not that easy, especially for the tall one, given the dimensions of the cloth! Then, we moved into the shower area where we were a bit puzzled finding a very low shower knob at roughly 0,5m from the ground, a little stool and a bucket! This is the Japanese shower: mimicking, we started by rinsing the little stool before sitting on it and filling up the bucket to pour it over ourselves, to then use the often provided shower gel, shampoo and conditioner to make sure we were clean enough to not contaminate the onsen, hence rinsing thoroughly afterwards. As importantly, we rinsed the little stool after using it. Eventually, we were ready to enter one of the many hot baths! We just had to watch out for the modesty towel to ensure it never touches the water, often carrying it on our heads. Entering the Yamamizuki onsen was truly amazing: we followed a little path along the river among bamboos and cedars to the sound of cicadas and birds, leading to a minimalist wooden Japanese style building, where we soaked ourselves in 2 hot baths overlooking a waterfall. The steamy bath made us want to cool down with a cold shower, before we entered the open-air bath or rotenburo: a man-made pool of volcanic stones with just the cooled down to 42°C water from the spring with the slight smell of sulfur. It is a truly unique experience which we found thoroughly enjoyable. While the Yamamizuki waters are mildly acidic to relieve fatigue and insomnia, the waters of Kurokawaso onsen contain hydrogen carbonate to soothe burns and heal scars and chloride and sulphate to help the body retain heat and moisture. While locals tend to just hop on the bath for a few minutes, we went for a spa-like experience, staying a lot longer in the springs. Feeling completely relaxed, we strolled through the village, passing Japanese onsen goers dressed in yukatas (light cotton bathrobe and setta sandals) to Yamanoyado Shinmeikan onsen, set in darks caves. From our first mixed bath, we had a great view on the village while enjoying the sulphur spring, useful for the treatment of acne and skin complaints. We thoroughly enjoyed the onsens of Kurokawa and their beautiful settings among the peak of the Yufu mountains. We were positively surprised by the cleanliness of all the onsens, or shall we say their purity. Onsens are way-more than just a hot bath: they are a truly unique cultural experience with its very specific rituals; they are a communion with nature, where one can thoroughly indulge oneself to the condition of respecting this gift from deep inside the Earth. Japanese people are very aware of this, as we have often seen them bowing to the spring in a thankful prayer upon leaving. 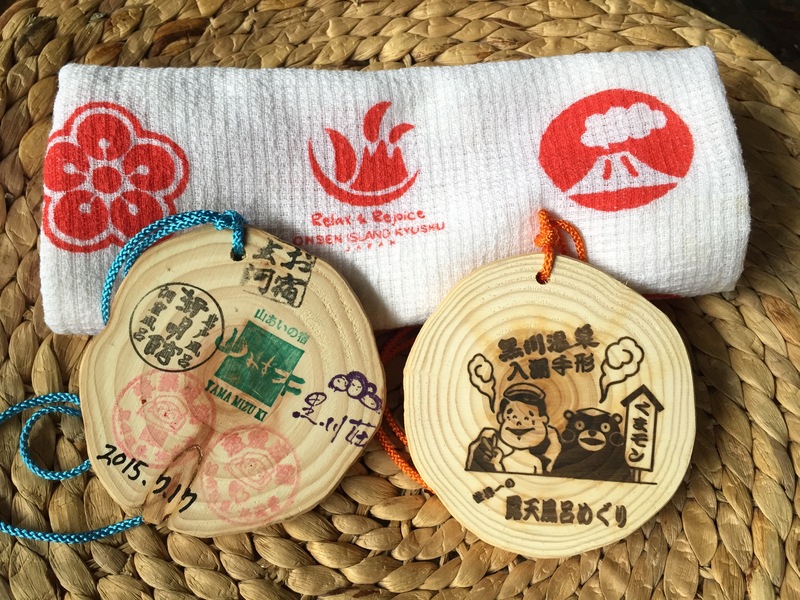 This entry was posted in Japan, Kyushu and tagged behind the scenes, culture, hotspring, off the beaten path, photography, travel. Bookmark the permalink. This kind of onsens seem to materialize the soul of Japan, deeply rooted in nature understanding. Congratulation for this article; it makes me want to go there! Tried and loved it last Dec!